Special attention has to go into the design of a kitchen to ensure you don’t compromise with safety for looks. Safety precautions include & not limited to installing anti-slip flooring, placing electric outlets at a safe distance from water source, placing ovens at a safe altitude, installing temperature control in faucets and creating a safe storage place for fire extinguisher. Resort to other ways of economizing instead of reusing old appliances from your previous kitchen. 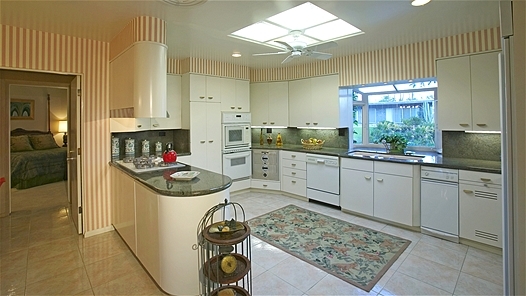 An old appliance in a new kitchen sticks out prominently and does not always gel with your new kitchen design. The sink, stove and refrigerators are regarded as the triangle of a kitchen since they experience heavy action and usage in a typical day. Set up an effective kitchen design that lets you access these amenities without hindrance. Sauce or oil-splashed kitchen walls is not a pretty sight; especially if masking these stubborn stains demands a repaint! 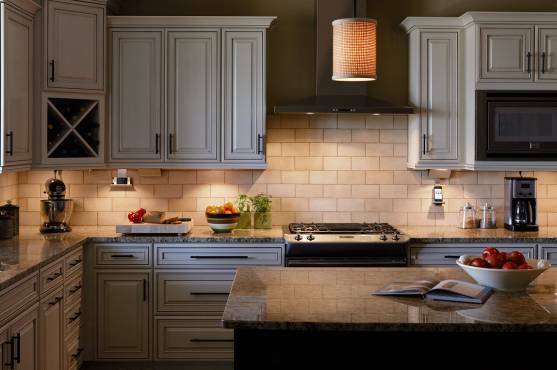 Backsplash made of tile, glass, metal, or plastic must be your choice instead of wall paints and wallpapers behind the sinks, cooking range and food preparation countertops. A kitchen is one place that requires ample storage space to shove away the endless list of groceries, new dishes and kitchen gadgets. 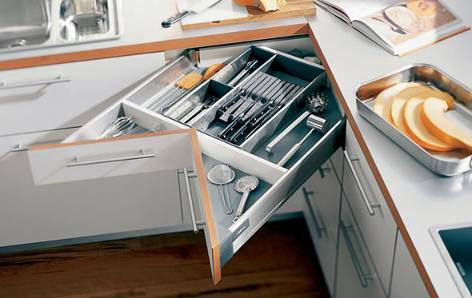 Corner drawers and fridge-top cabinets can prove to be the best utilization of available storage spaces. Consider drawers with deep pockets to fit in almost everything in the kitchen. Make sufficient provision for appropriate power sources for relocated or new appliances that may take place in the future. You will never know if you will need an additional dishwasher or if you decide upon adding a multi-temperature cool drawer to supplement your fridge. Considering the number of appliances that go on to your countertops, you will have to decide upon the free countertop area you will require. Think ahead about your countertop material – tiles are hard to maintain and stainless steel will scratch easily! Choosing Quartz would be a smarter choice – it is the toughest countertop material that can resist burns, scratches and chipping. Your kitchen is a main place that requires frequent air-outs. A quiet stove-top kitchen hob should top your list of appliances for sure. Proper planning for natural cross-ventilation also proves beneficial to bring in some fresh air. A well-lit kitchen reduces accidents while flaunting your awesome kitchen design at the same time. Install LEDs for hidden places like the countertops underneath the cabinets. Nightlights inside glass cabinets can flaunt your lovely collection of china. Opt for an island only if you have a large kitchen; an island should be at least 4 feet long & 2 feet deep with enough room for people to move and work around without bumping into each other! An Island no doubt provides extra countertop space for your kitchen. Recycling is here to stay. So be prepared to manage your trash efficiently by incorporating trash sort bins into your kitchen design. With the availability of an array of trash bins that can disappear into the walls of your kitchen, you need not worry about sticking a trash bin in the most obvious space of your precious kitchen. Avoid the mistake of following a trend and choosing too very trendy equipment; which end up with a very short half-life and go out of fashion very fast. While choosing kitchen equipment, concentrate on the value these appliances add to your life instead of following your impulse and the current trends. Certain fads like the touch-activated or hands-free faucets will never go out of fashion due to their utility. These fixtures are suitable for a household with children who cannot reach the faucet knob. Turning on water with dough-smeared hands is an uncomfortable sight for sure! Adding instant warmth can be achieved by choosing an ideal kitchen rug from the modern rugs for kitchen collection conveniently available online. A modern rug suits almost every kitchen design and further accentuates the great looks of your kitchen. You don’t want to repent over permanent design mistakes so certain tasks are best left to professionals; bring in a professional who can advice on the best kitchen design plan suitable for the available space and advice whether “Ready to Assemble Cabinets” are the thing for your kitchen. I really like your tip about making sure that you plan ahead for power outlets when it comes to remodeling your kitchen. My husband and I have been thinking about redoing our kitchen for a while now so we will have to keep these tips in mind. Hopefully, we can find a great contractor to work with on the whole project. Thank you for sharing!